Practically anything can be shared. Increasingly, nonprofits are looking for ways to economize and reduce duplication, and sharing back office functions like accounting, HR, IT, and more are great places to start. 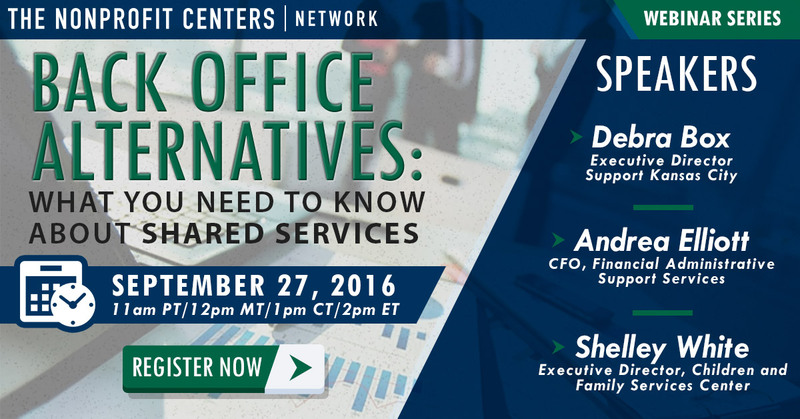 On this webinar, you will hear from three different shared service providers that specialize in a variety of administrative services for nonprofits. Debra Box of Support Kansas City, Andrea Elliott of Financial Administrative Support Service, and Shelley White of the Children and Family Services Center will share what makes their models unique. You will also learn about the benefits and challenges of sharing the back office with other organizations, along with what you should consider if you are interested in starting this work in your community.